Carly Fiorina slammed today's hostile business climate. Republican presidential candidate Carly Fiorina has a number of goals: cut taxes, cut government size and spending, and provide a pro-business climate for small business to flourish. Fiorina’s remarks, slamming the size of government and politicians who get “captured by the status quo,” were well-received by around 75 Granite State voters who showed up to her campaign stop Friday afternoon at the VFW in Lancaster, New Hampshire. “The truth is, the potential of too many Americans, indeed the potential of this great nation, is being crushed by the weight, power, cost, complexity, the ineptitude, and the corruption of the federal government and the political class,” Fiorina told the crowd, which included many veterans. Fiorina went on to slam the broken immigration system, burdensome business and environmental regulations, and the suffering of veterans dealing with the beleaguered Veterans’ Administration. “Here we are in the VFW. How long are we going to accept that those who have served us, our veterans, will not be served by the Veterans’ Administration? The Veterans’ Administration has been a stain on our nation’s honor for 20 years,” Fiorina said, adding that pressure does impact politicians who pushed through a bipartisan bill following the Arizona VA scandal last year. “Just last month, I read a report that said over 250,000 veterans have died waiting for appointments. And did you hear anything out of the politicians, many of whom are running for office? Did you hear anything out of Washington? No. The ineptitude just grows,” Fiorina said. She went on to slam the business climate in the country, saying the owner of a New Hampshire sawmill she met wouldn’t be able to start his business today. Progressivism is a big part of the problem on various issues, from entitlement reform to economic betterment, Fiorina said. “Progressives believe some are better, some are smarter than others, some really can’t live lives of dignity and purpose. ‘Don’t worry, we’ll take care of you,’ [they say]. It is the height of disrespect and disregard, and I think it is a fight that we’re going to have to win in 2016,” she added of her disagreement with progressivism. Starting out in an accounting firm of nine employees as a secretary and eventually becoming CEO of Hewlett-Packard exemplifies the valuable opportunity afforded by small businesses, Fiorina said. In an answer to an extended question from the audience about income inequality, Fiorina said minimum wage laws should be left to the states and said that wherever progressive policies are put in place there is “crushing poverty” and misery. She added that she fundamentally disagrees that leftist economic policies, such as those of California Governor, Jerry Brown, have improved the lot of Californians. In fact, they have made things even worse, Fiorina claimed. Following Lancaster, Fiorina headed to a gathering at a home in the small community of Twin Mountain, New Hampshire. There, her Super PAC press secretary, Leslie Shedd, noted that the hosts had to clear their furniture because the crowd was twice as big as they expected. She referred to the potential future president as a “she,” setting up an obvious me-or-Hillary paradigm. Buoyed by her Fox News debate performance earlier this month, Fiorina showed the kind of focus and passion that can take a candidate from one of many to the top. “I know more world leaders on the stage today than anyone running, except perhaps Hillary Clinton, except she did photo ops,” Fiorina said, adding she had a meeting with Vladimir Putin, for example. Fiorina went on to mock Clinton for her growing e-mail problem. “So Mrs. Clinton, actually I do understand that you can’t prevent a server attack by burning it with Secret Service agents, and no you don’t wipe a server clean with a cloth,” she said. Fiorina said she’s never been a “token” but did emphasize how proud she is of her accomplishments and her pride in being a woman. “I hope I earn your support today, but even if I don’t, in your heart of hearts you know you can’t wait to see me debate Hillary Clinton,” Fiorina told the crowd who clapped, although the assumption that Clinton will be the Democratic nominee is becoming increasingly uncertain. 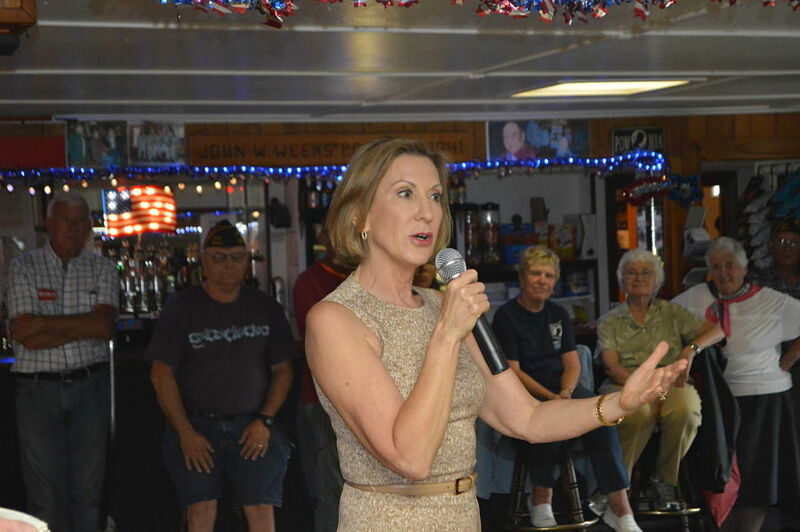 Fiorina had a good showing for a small town campaign stop and had the on-point messaging and intensity that will likely see her continue to appeal to a growing amount of conservative voters. At times her remarks, perhaps unintentionally, echoed those of Donald Trump, as she likened business principles to the way to properly run the country. “Managers operate within the status quo. They don’t challenge it. Leaders challenge the status quo,” she said. Trump recently slammed Fiorina’s record at HP as he campaigned in New Hampshire, claiming she ran it into the ground. Fiorina also talked about how her former access to lobbyists and the system at HP exemplified the imbalance faced by regular Americans. She said that as a businesswoman and someone who understands the free market, she is the right person for the job. “What leading a resurgence of a great nation requires now, is a president who actually understands how the economy works and what the engine of economic growth really is. She must understand the world and how the world works,” Fiorina said. She added that she’s been through a lot in her life, from beating cancer, to having her stepdaughter pass away. She will not give up. “I’m not going to fade, and I’m not going to falter,” she promised the crowd. Nonetheless, there is a likely obstacle ahead as Fiorina works to increase her national political profile. CNN’s criteria are likely to leave Fiorina off the debate stage in September, despite her recent significant rise in poll numbers, something The Federalist asked her about following her remarks in Lancaster.